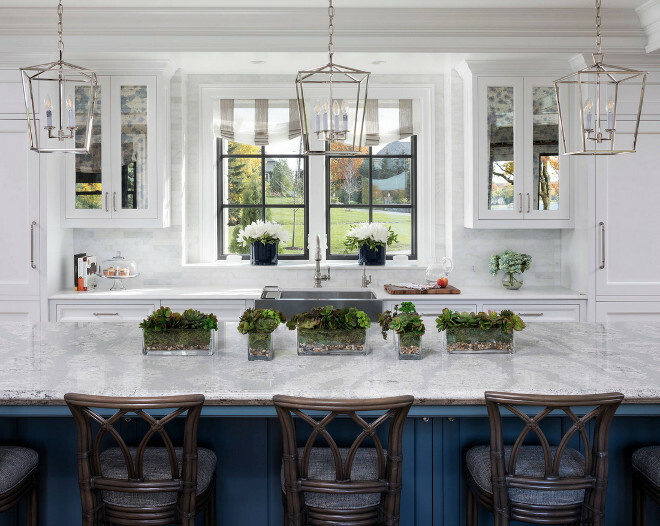 If you’ve read Home Bunch for a while you probably know that I like to keep things fresh around here and I am happy to posting only traditional interiors today. 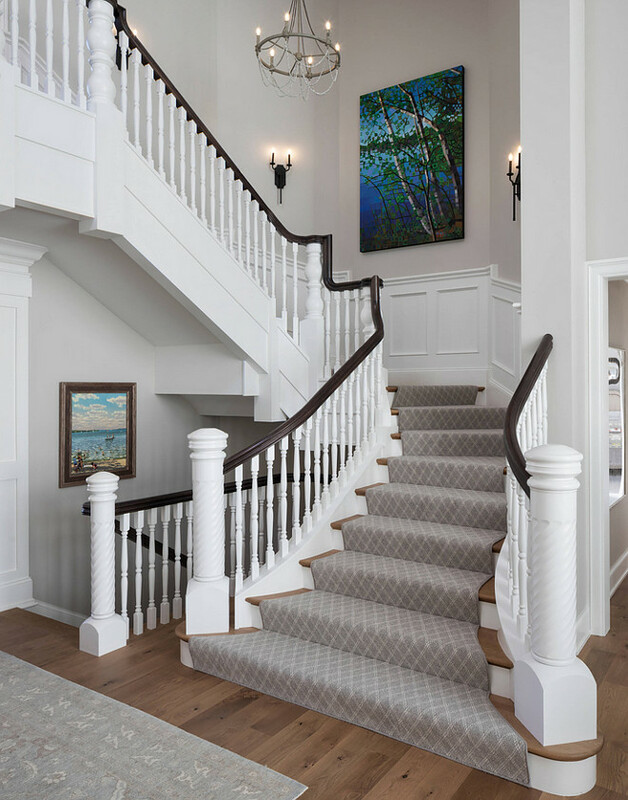 The interesting thing is that if you look a few years back, the two words “traditional interiors” felt serious and almost “heavy” but I feel that they are changing. 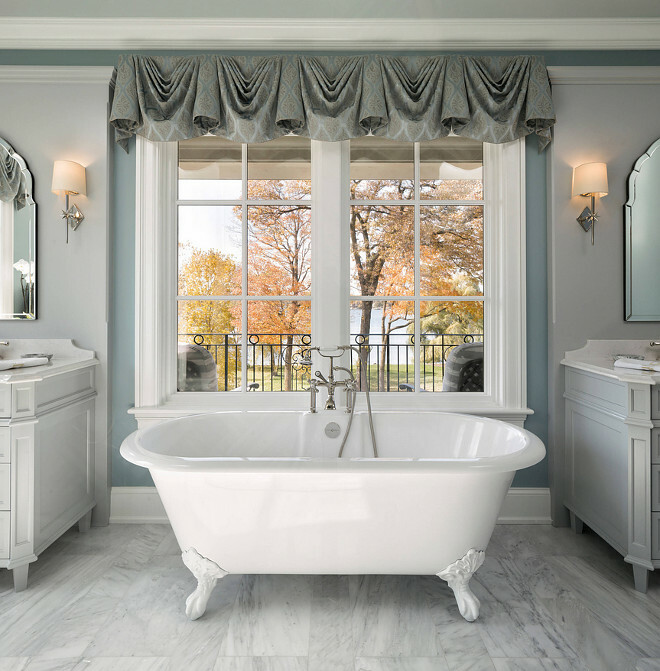 Built by John Kraemer & Sons, this French-inspired lakehouse features traditional interiors full of color and they couldn’t feel more current. 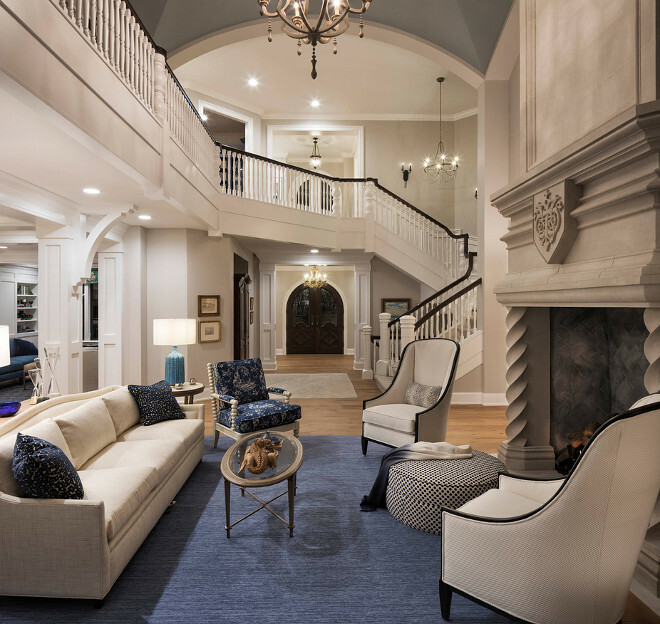 There’s no questioning the beauty of these interiors, and while some spaces are quite formal, this home feels very livable overall and welcomes today’s life with its many conveniences while not losing its elegance. 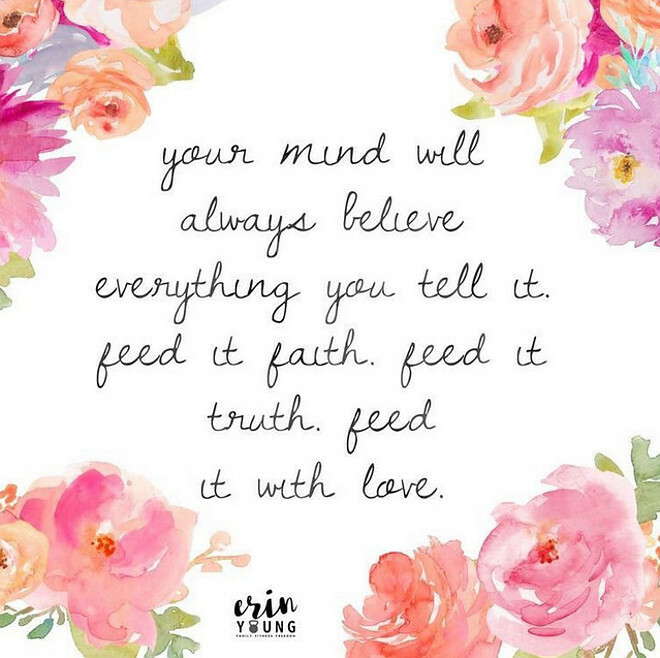 I hope you can relax, feel inspired and have a good time here. 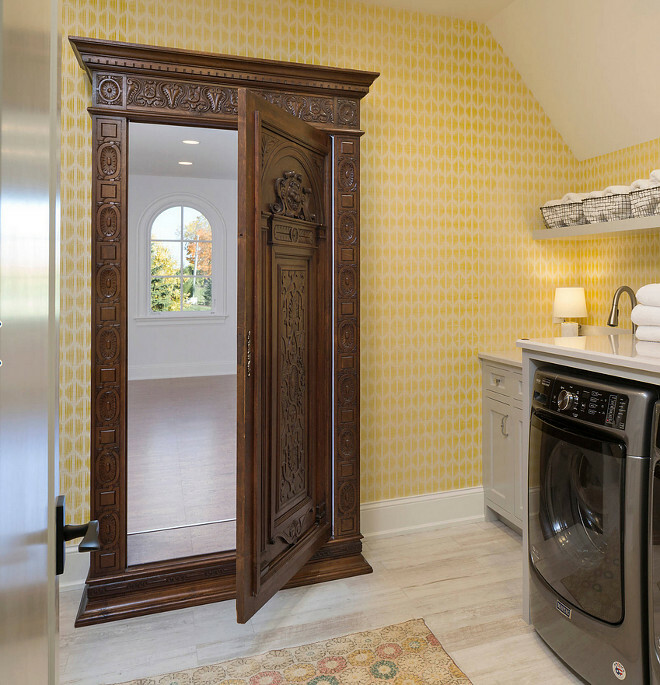 The front door is from Craftsmen in Wood. 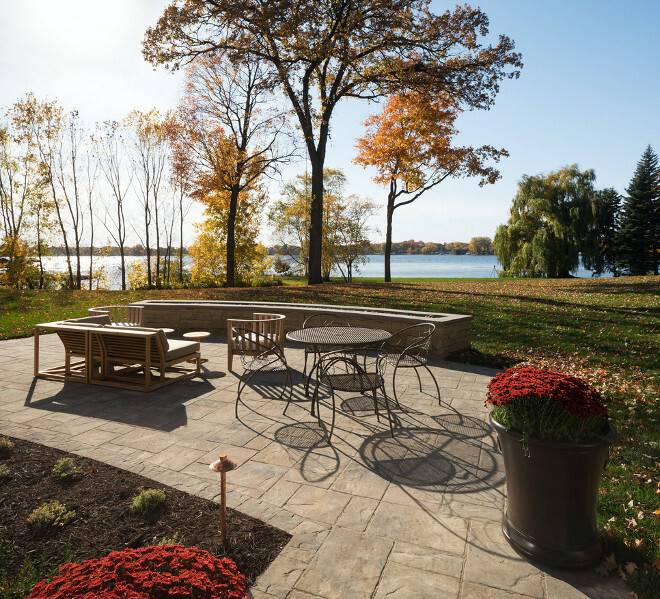 Builder: John Kraemer & Sons. 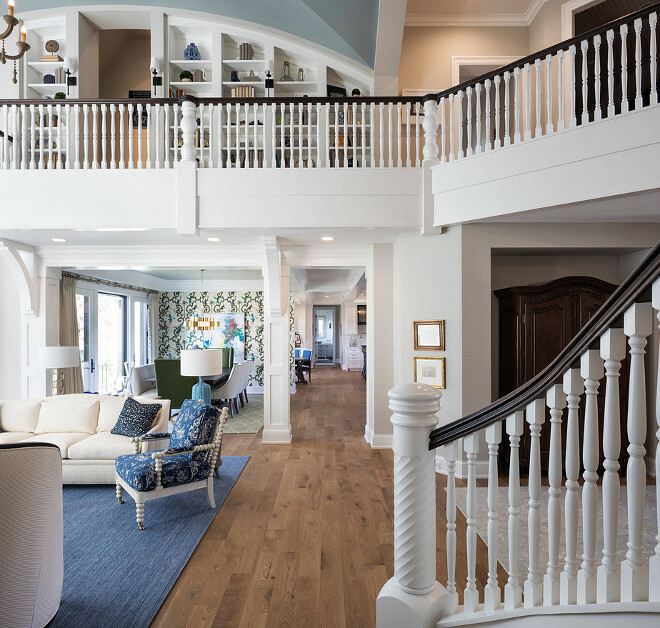 This home features 13,000 square-feet. 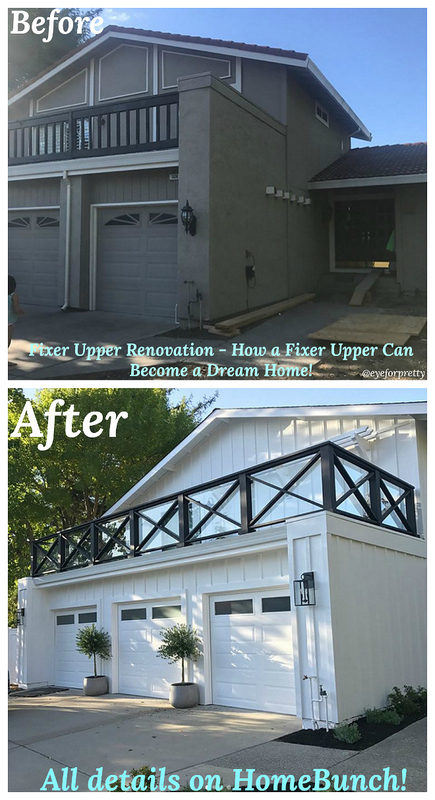 French-style home with beige stucco siding and black windows. Roof is Certainteed Grand Manor. Ceiling Paint Color: Mount Saint Anne 1565 by Benjamin Moore. 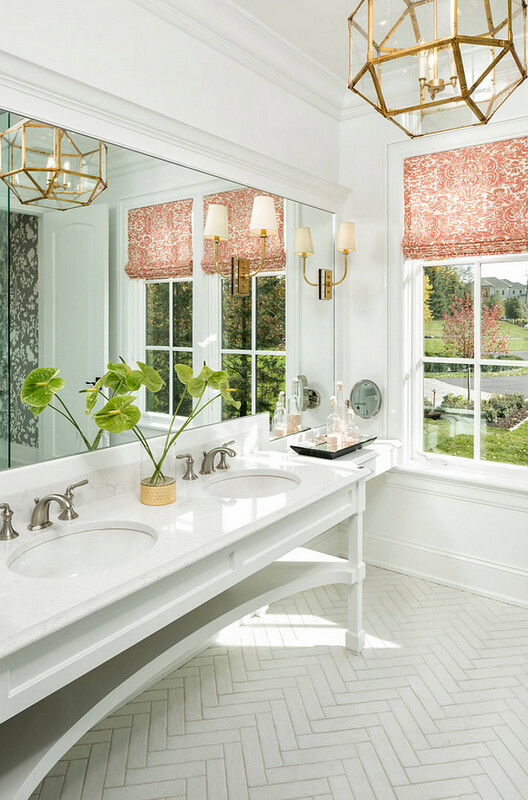 The home beautifully mix European and modern influences, reflected in elements like the stucco exterior, traditional cabinetry, beamed ceilings, and crown moldings. 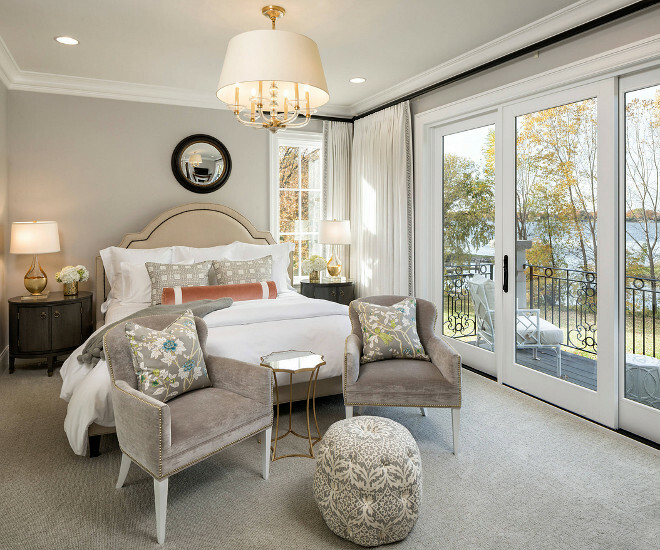 Interiors: Bonnie Birnbaum Interiors & Diane Lumpkin Design. The accent chairs by fireplace and ottoman are from Hickory Chair. Pillow fabric from Lee Jofa. Fireplace features dramatic two-story mantle and it is by François & Co. Chair fabric from Brunschwig & Fils. Wall Color: Bruton White by Benjamin Moore. 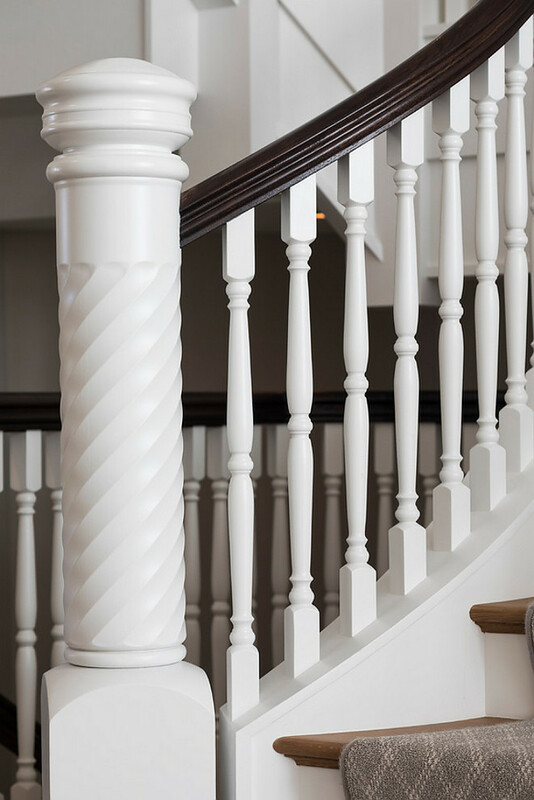 Newel Post and Spindles Paint Color: Chantilly Lace by Benjamin Moore. Interior Design: KOR Interior Design & Herrick Design Group. 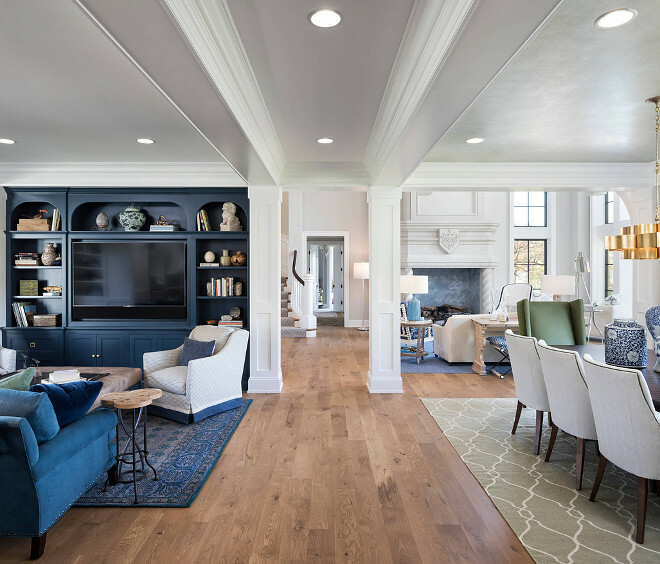 Formal living room leads to dining room and family room. 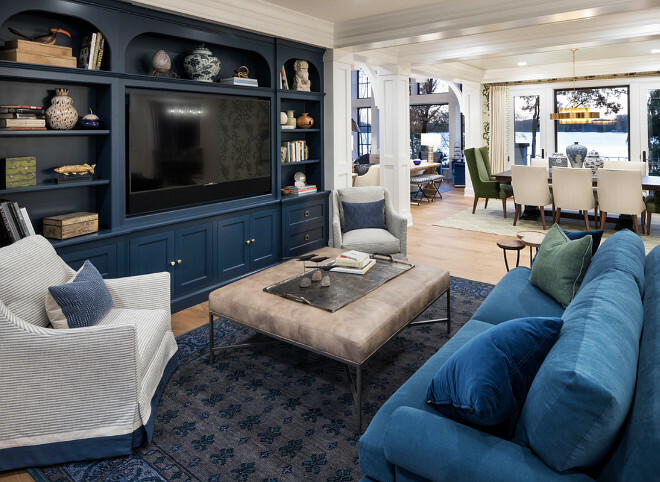 Dining room opens to an indigo family room with custom cabinets. 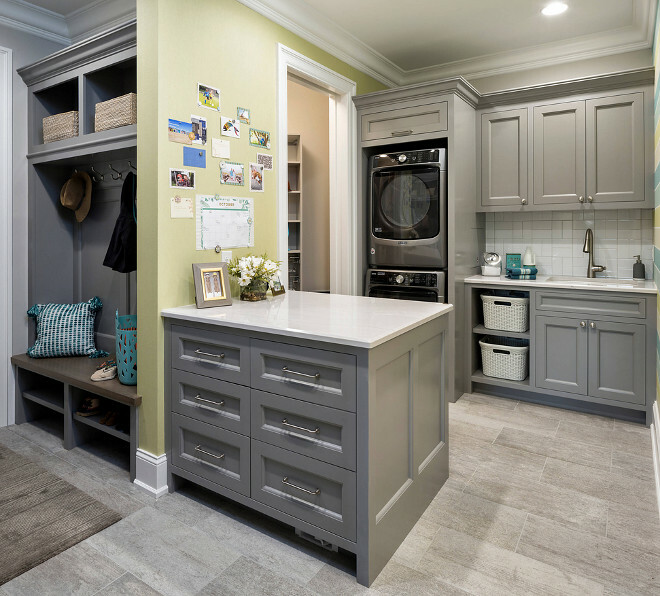 Cabinetry is painted in Gentleman’s Gray 2062-20 by Benjamin Moore. 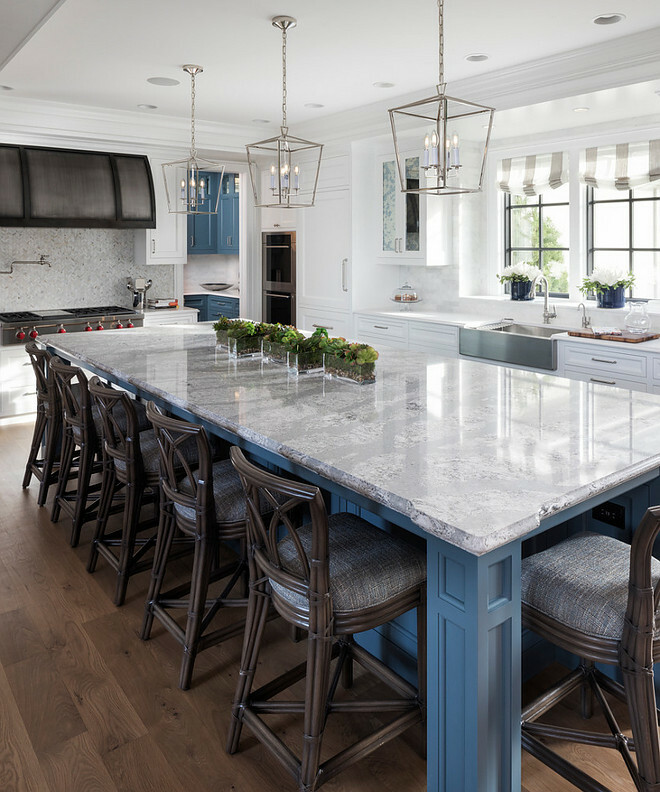 This 14-foot-long kitchen island makes for the perfect place to gather during meal preps. 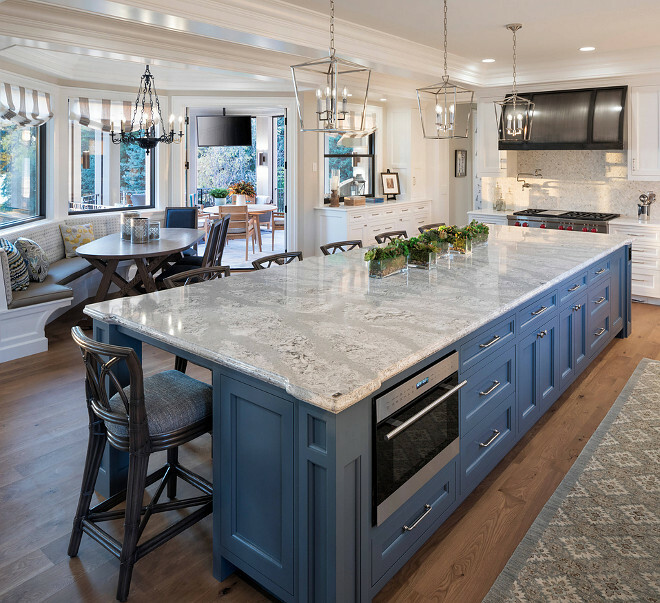 Kitchen island countertop is Summerhill Cambria Quartz. 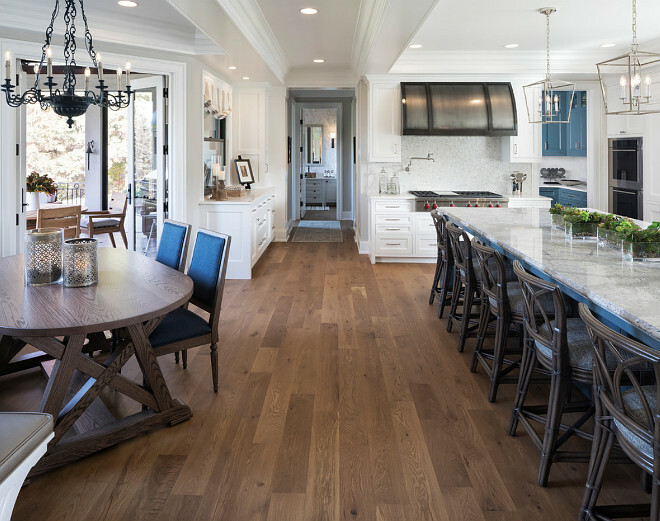 Hardwood Flooring is Rift Cut White Oak. 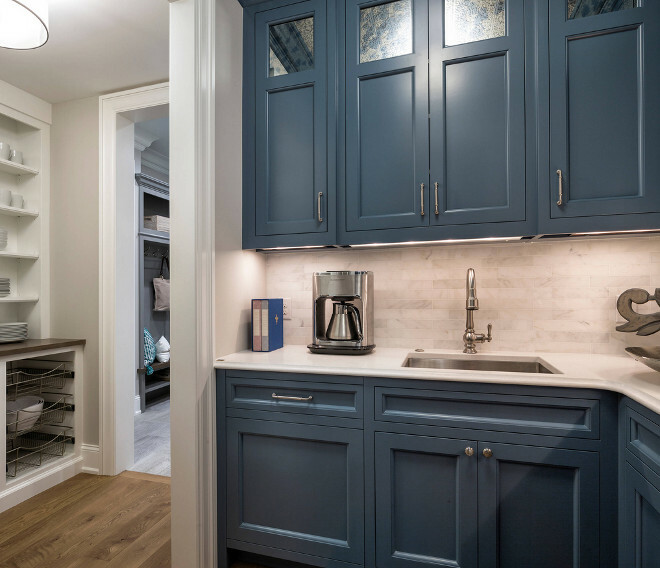 Beautiful kitchen with white perimeter cabinets, blue island and blue butler’s pantry. 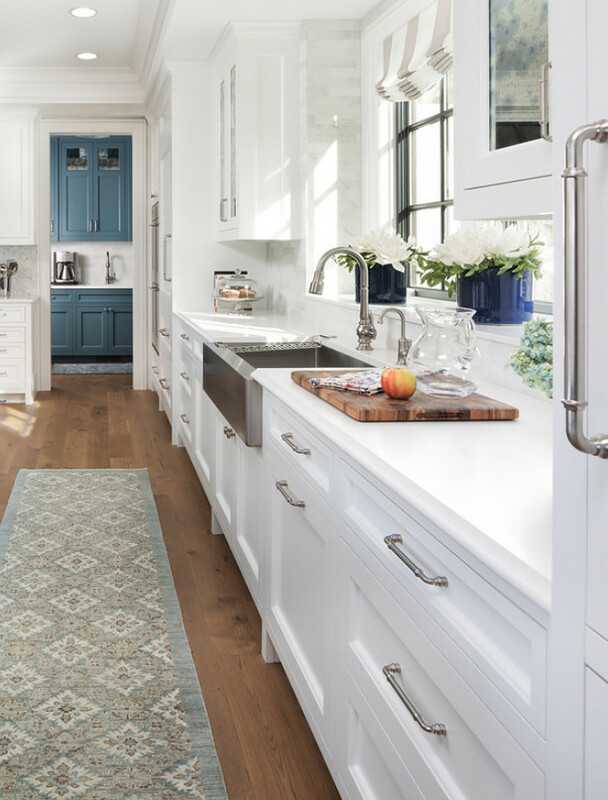 Shaker-style kitchen with white quartz countertop and stainless steel farmhouse sink. 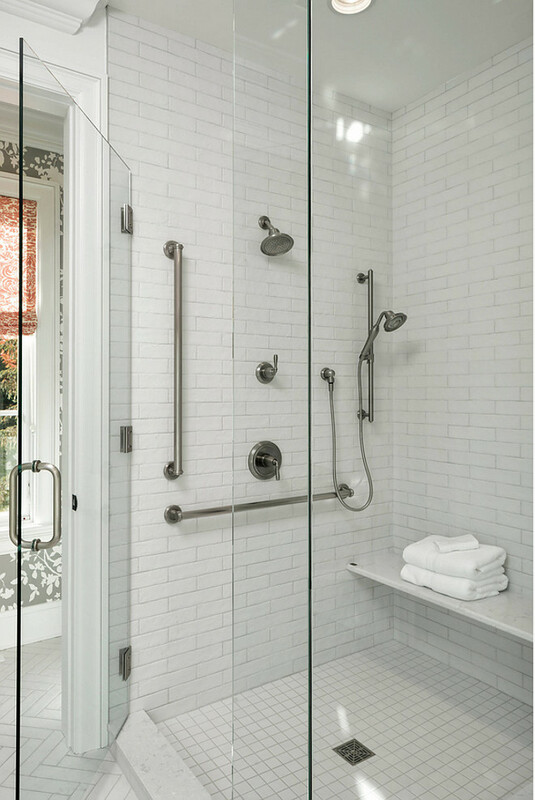 Faucet: Kohler – this is one of the best kitchen faucets – it’s not too pricey and it’s quite durable. 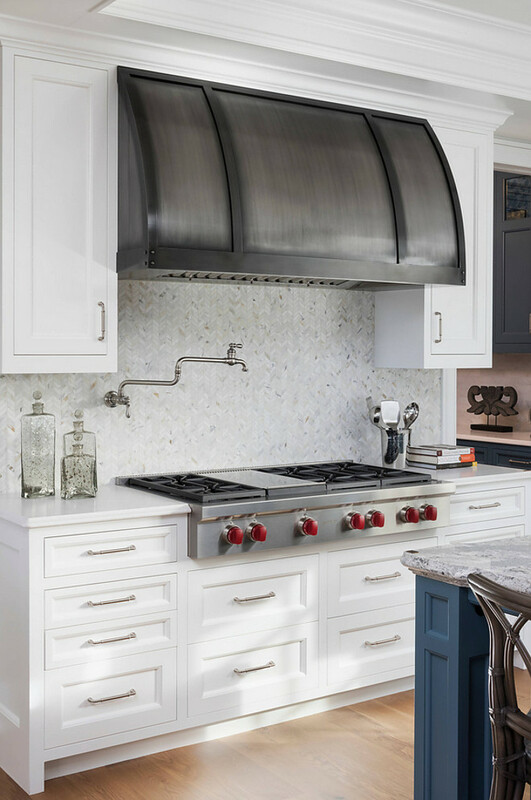 Backsplash: 1″ x 2″ Herringbone Mosaic Tile in Calacatta Oro. Pot filler is by Kohler. Similar Hoods: Here, Here & Here. 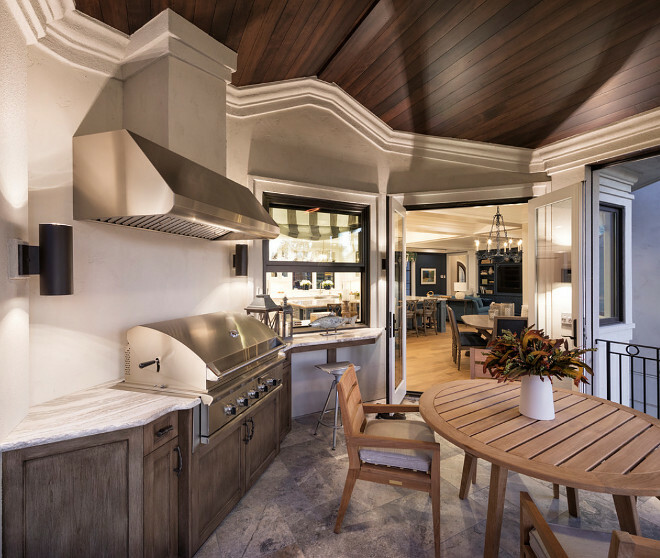 Kitchen doors open to an outdoor patio with built-in bbq and teak dining furniture. 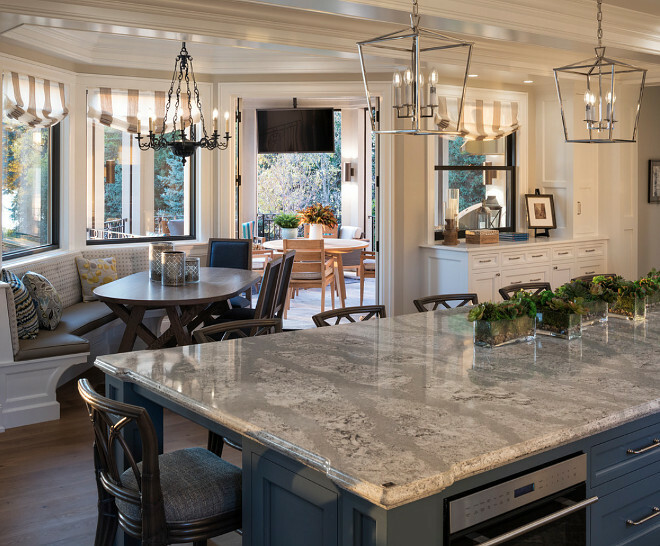 Lighting should be installed 28 to 34 inches above the countertop, or 72 inches above the floor, leaving 24″ minimum apart from each pendant. Similar Succulent Vases: Here, Here, Here, Here & Here. Inspiring Rattan Counterstools: Here, Here, Here, Here & Here. 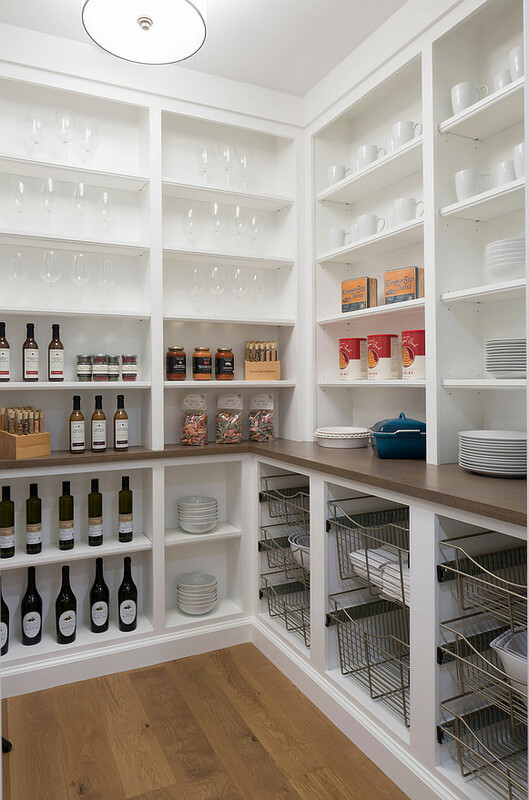 Pantry with pull-out wire baskets. 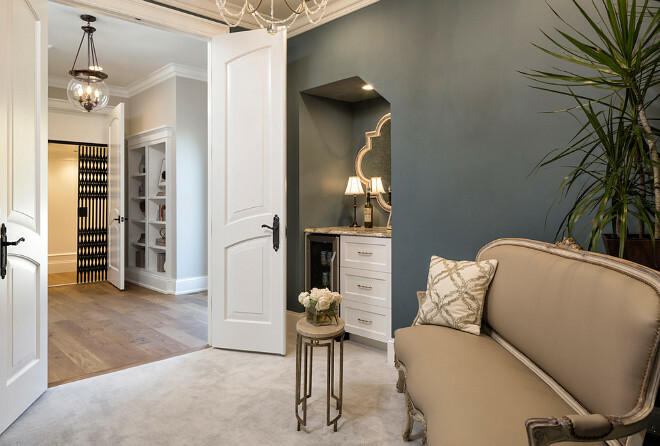 Library with custom paneling, bookshelves and patterned carpet flooring. Desk is Bernhardt. More Beautiful Desks: Here, Here, Here, Here, Here & Here. Task Lamps: Here & Here. Interior Design: Laura Engen Interior Design. 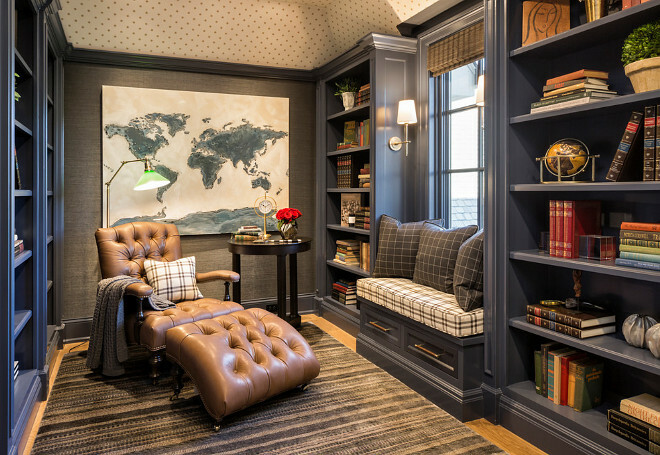 Den with navy blue bookshelves and windows-seat. 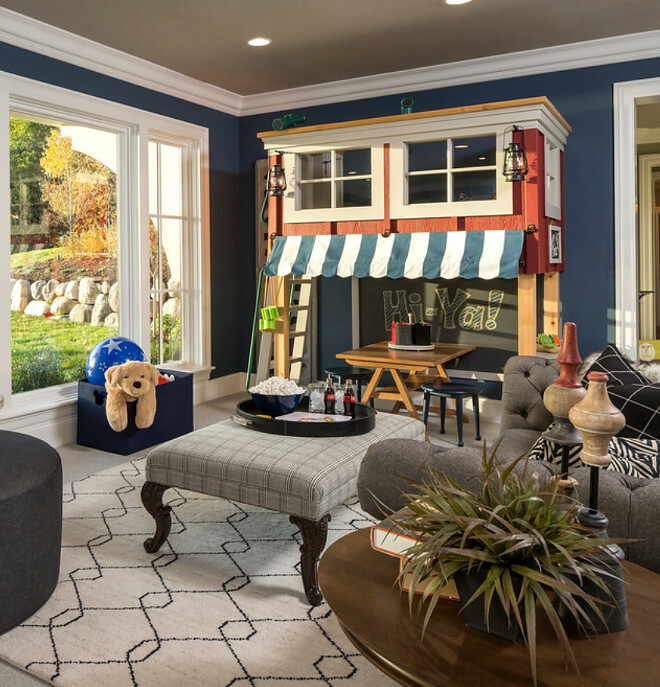 Paint color is Hale Navy by Benjamin Moore. Window seat and pillow fabric from Kravet. Similar Grey Plaid Pillows: Here, Here & Here. Similar Chair & Ottoman: Here & Here. Interior Design: Laura Wiedmann Interior Design. 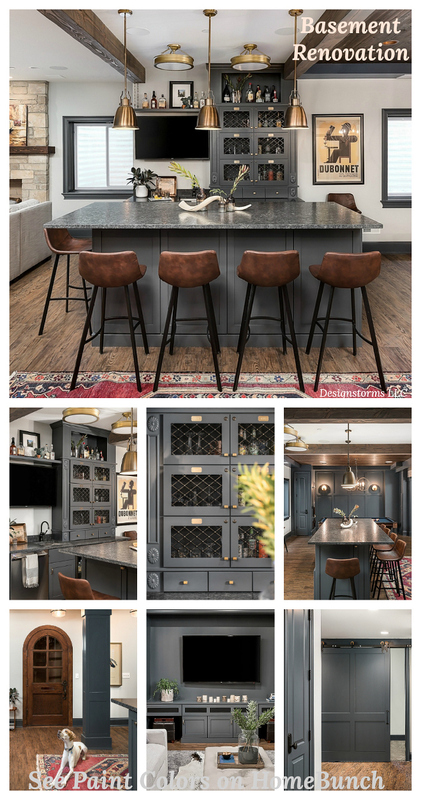 Paint: Edgecomb Gray by Benjamin Moore. 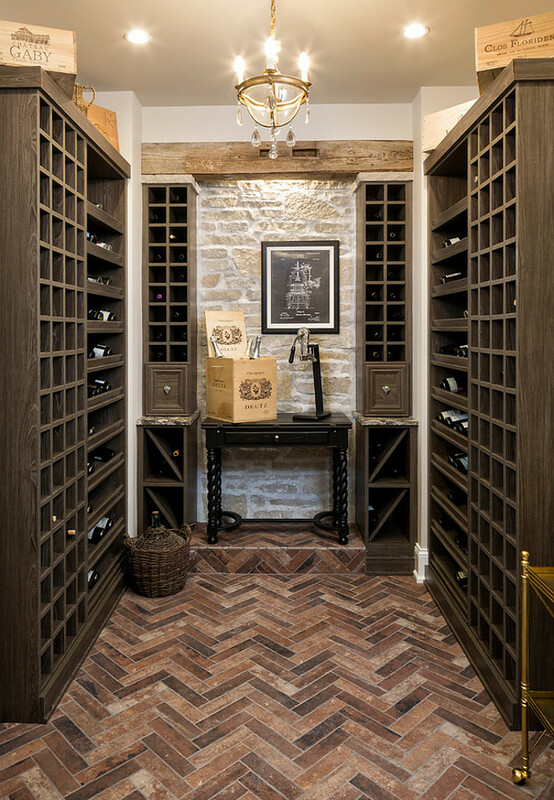 Herringbone Floor tile from Rubble Tile. 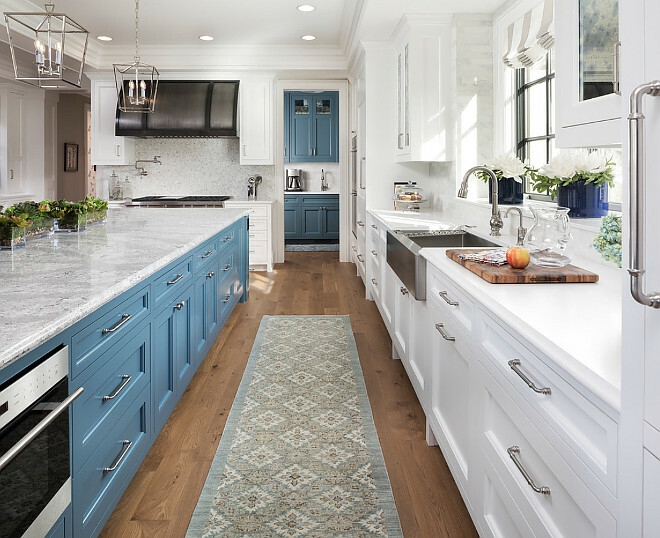 Paint Color: Van Deusen Blue by Benjamin Moore. 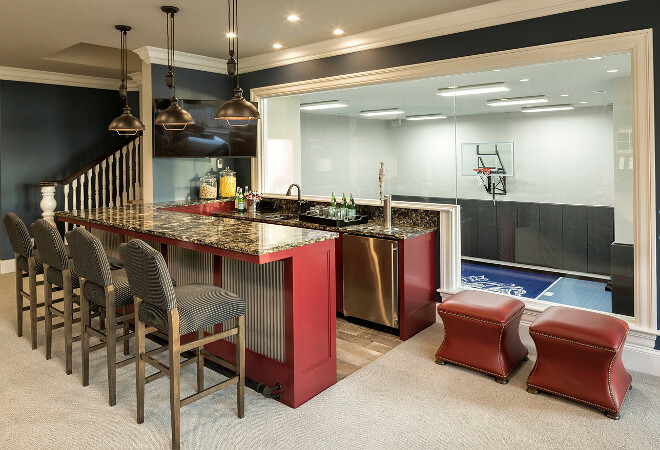 Basement bar with view to indoor basketball court. Bar paint color is Classic Burgundy by Benjamin Moore. Pendant light can be found here. 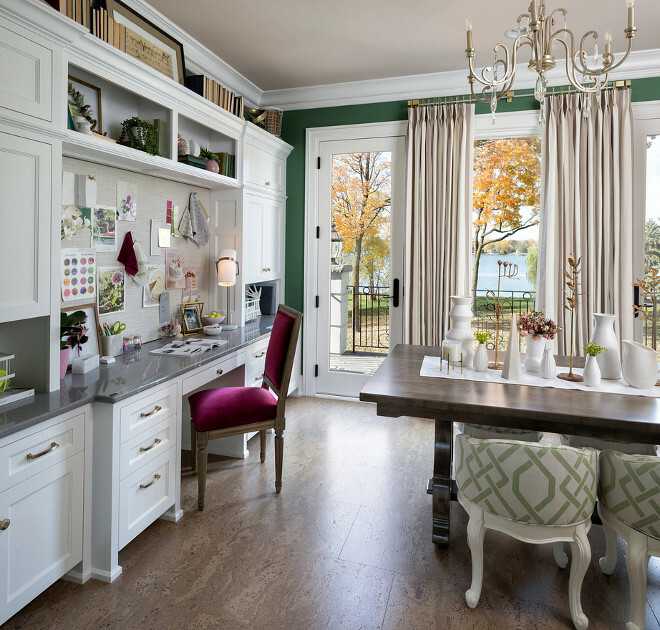 Home office/ craft room features cork flooring. Wall color is Fairmont Green by Benjamin Moore. Ceiling color is Night Mist by Benjamin Moore. Pillow fabric from Tucker Thomas Interior Design. Similar Accent Table: Here, Here, Here, Here & Here. Similar Pouf: Here, Here & Here. Similar Nightstand: Here – Inspiring Nightstand: Here & Here. 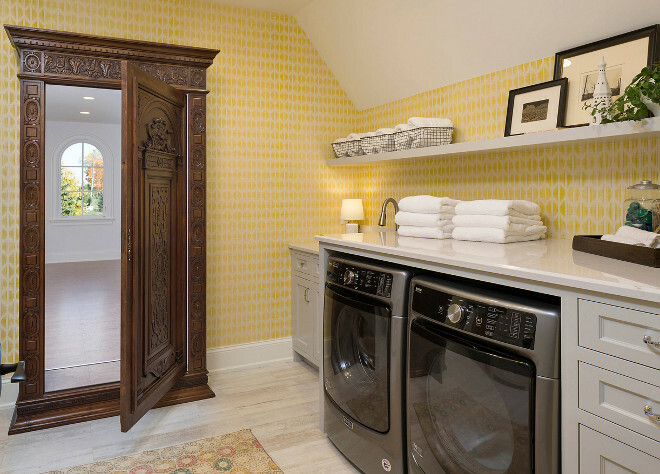 Interior Design: Tucker Thomas Interior Design & Lenox House Design. White Tile: Here, Here, Here, & Here. 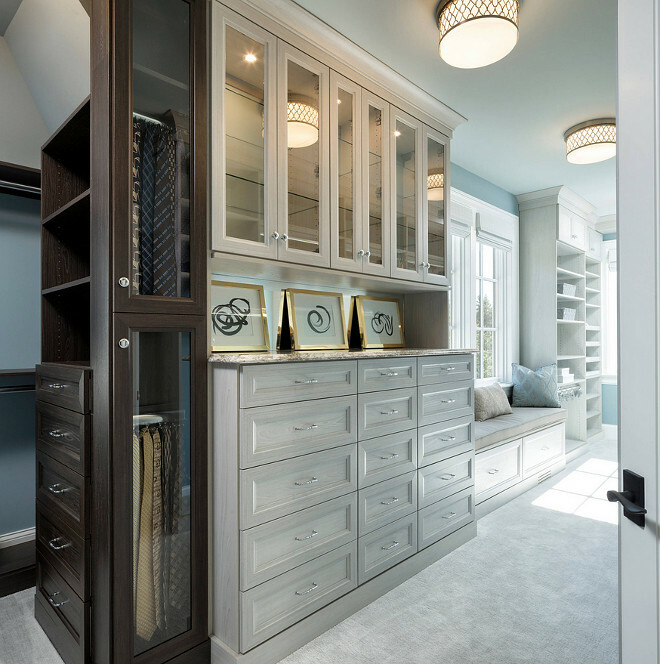 Dressing room with custom cabinetry and window-seat. Traditional bedroom with barrel ceiling with lake view and a curved curtain rod. Ceiling paint color is Santorini Blue by Benjamin Moore. 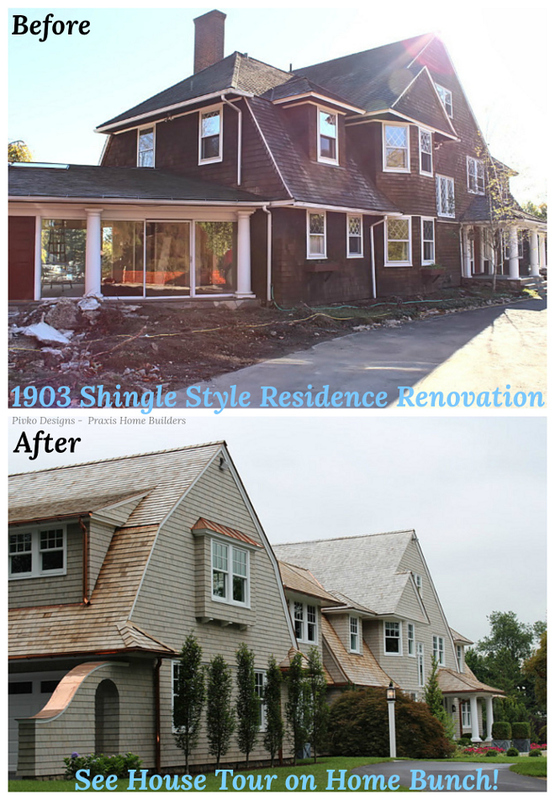 Interiors: Interior Places and Spaces & KSID Studio, LLC. 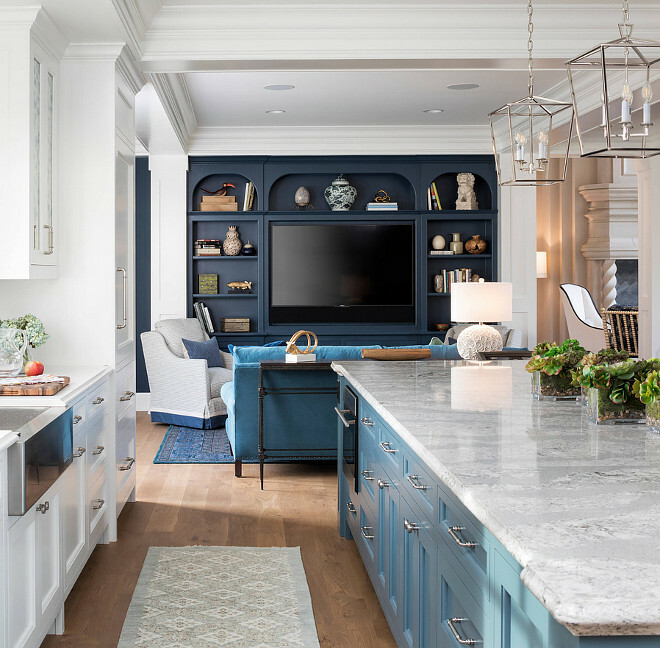 Paint Color: Providence Blue by Benjamin Moore. Wow, this home is stunning. Thank you.